Montag (Heute)Dienstag, 23. März.Mittwoch, 24. März.Donnerstag, 25. März.Freitag, 26. März.Montag, 29. März.Dienstag, 30. März.Mittwoch, 1. April. Ecuador investiert einen großen Teil seiner Goldreserven an Goldman Sachs und erhält im Gegenzug von der US-Investmentbank Kredit. Die Regierung des Landes erklärte am Donnerstag, Goldman Sachs habe einen Kredit über 400 Millionen Dollar bewilligt, nachdem die Zentralbank des Landes einen Teil ihrer Goldreserven bei der amerikanischen Bank angelegt habe. Das Finanzministerium teilte mit, dass der Kredit über 33 Monate laufe und mit 4,3 Prozent verzinst werde, weitere Details nannte es nicht. Ein Sprecher von Goldman Sachs wollte sich zu der Angelegenheit nicht äußern. Die Zentralbank des südamerikanischen Landes hatte Anfang der Woche erklärt, dass sie mehr als die Hälfte ihrer Goldreserven an Goldman Sachs übertragen wird, um diese zu Geld zu machen. Insgesamt habe sie 465.619 Feinunzen Gold im Wert von rund 580 Millionen Dollar an die US-Bank verliehen. MADRID (MarketWatch) — Gold prices moved in tight ranges on Friday after a U.S. jobs report that largely met expectations, as the metal looked at a gain of just over one half-percent for the week. At last check, gold for August delivery GCQ4 -0.49% was up $2.80, to $1,256.10 an ounce. July silver SIN4 -0.88% rose 5 cents, to $19.13 an ounce. A surge in new U.S. jobs from February to April marked the best three-month stretch in two years, and that stretch appeared to continue with May data that showed a gain of 217,000. Analysts were looking for a 210,000 jump in nonfarm payrolls in May. The unemployment rate held steady at 6.3%. In the prior session, gold prices notched their biggest rally in three weeks, after the European Central Bank cut interest rates and announced other easing measures that weighed on the euro. IG Markets analyst Alastair McCaig said that Europe did its part, now it’s the next country’s turn, and he’s not talking about the jobs report in the United States. Elsewhere in metals trading, July platinum PLN4 +0.12% rose $8.10, or 0.6%, to $1,453.20 an ounce, while September palladium PAU4 +0.46% added $3.90, or 0.5%, to $843.35 an ounce. High-grade copper for July delivery HGN4 -1.70% dropped five cents, or 1.6%, to $3.04 a pound. An ongoing investigation into the use of the metal for getting loans held in China’s Qingdao ports will cut into demand. (Kitco News) - Gold prices are trading steady to slightly higher in the immediate aftermath of a U.S. jobs report that showed non-farm jobs rose a bit more than expected. Gold traders and investors have apparently reckoned their metal’s prices had fallen too far during the recent sell off and the market deserves at least a short-covering bounce. August Comex gold was last up $1.90 at $1,254.60 an ounce. Spot gold was last quoted up $1.00 at $1,254.75. July Comex silver last traded down $0.023 at $19.06 an ounce. Friday morning’s U.S. employment report for May showed a slightly higher than expected rise of 217,000 in non-farm payrolls. The key in the report was forecast to rise by 210,000. The U.S. stock markets are hovering at record or multi-year highs to end the trading week. Meantime, European stocks and government bonds have rallied late this week. A new and aggressive European Central Bank monetary policy stimulus package announced Thursday and dovish corresponding remarks from ECB president Mario Draghi were deemed stock market and European bond market bullish. Worries about stagnant European Union economic growth and deflationary price pressures forced the hand of the central bank. The ECB move on Thursday has bolstered the notions of some in the market place that the U.S. Federal Reserve may be forced to back off its plan of “tapering” its quantitative easing. It seems incongruous in this age of integrated world economies and markets to have the European Union stimulating its monetary policy, while at the same time the Fed is reeling in its monetary easing. The London A.M. gold fix is $1,254.00 versus the previous P.M. fixing of $1,252.50. Technically, August gold futures bears still have the firm near-term technical advantage. A 10-week-old downtrend line is in place on the daily bar chart. A bullish weekly high close on Friday would provide the bulls with some fresh upside technical momentum, to begin to suggest a near-term market bottom is in place. The gold bulls’ next upside near-term price breakout objective is to produce a close above solid technical resistance at $1,268.50. Bears' next near-term downside breakout price objective is closing prices below solid technical support at $1,220.00. First resistance is seen at this week’s high of $1,257.90 and then at $1,261.50. First support is seen at $1,250.00 and then at this week’s low of $1,240.20. July silver futures bears have the solid overall near-term technical advantage. However, a bullish weekly high close on Friday would give the bulls a bit of upside technical momentum. Silver bulls’ next upside price breakout objective is closing prices above solid technical resistance at last week’s high of $19.50 an ounce. The next downside price breakout objective for the bears is closing prices below solid technical support at $18.00. First resistance is seen at the overnight high of $19.20 and then at $19.40. Next support is seen at the overnight low of $18.995 and then at $18.75. So ist die Produktion im April gegenüber dem Vorjahresmonat nur um 3,6 Prozent gestiegen, nach einem Zuwachs von gut 5 Prozent im März. Für das gesamte Jahr erwarten die Analysten von UniCredit sogar ein Defizit von rund 950.000 Tonnen. Kein Wunder, dass daher auch der Preis des Industriemetalls zuletzt Boden gutmachen konnte. Gestützt wurde der Kurs aber sicherlich auch von einigen zuletzt erfreulichen Konjunkturindikatoren - allen voran aus den USA. Sollten die jüngst geschmolzenen Lagerbestände an der London Metal Exchange (LME) weiter sinken, könnte dies den Aluminiumkurs zusätzlich beflügeln. Zuletzt gelang es Aluminium, aus seinem Jahre währenden Abwärtstrend auszubrechen. In diesem Jahr führte ein erster Ausbruchsversuch bereits an die Marke von 1.860 Dollar, die sich nun als Wi- derstand erweist. Gelingt kurzfristig ein Anstieg über diese Hürde, ist mit einer nachhaltigen Trendumkehr bei Aluminium zu rechnen. Es wäre dann zu erwarten, dass Alumi- nium unterbrochen von einigen Gegenbewegungen Kurs in Richtung 2.100 Dollar nimmt. Für den Fall, dass Alumi- nium deutlich unter 1.800 Punkte rutscht, könnte die Zuversicht bei Anlegern allerdings so schnell wieder verfliegen wie sie gekommen ist. THREE-and-a-half kilometres underground, no one can hear you scream, I tell myself as the drills hammer their way through solid rock. I am at the deepest point of Driefontein’s No 5 shaft, west of Johannesburg. It is a work environment like no other. A rock-drill operator named Whitey is king. His kingdom is a jagged tunnel known as a panel, blasted out of the battleship-grey rock where the gold lies. The panel’s low roof forces you into a crouch. The inclined floor is covered with loose rock, the detritus of previous advances into the earth. The rockface temperature approaches 60°C, and although mines are required to cool the stopes to about 28°C, humidity approaching 100% causes continuous and heavy perspiration. It is a cramped, claustrophobic space shared by stripped-down workers, rusted drilling machines and rock fragments. Around Whitey, helmeted mineworkers toil in a strange, slow silence. Some spray-paint red dots on the rockface where holes must be drilled for blasting. Others attach air and water hoses to his rust-brown drilling machine, which has "AK47” as a nickname. Earplugs seem a pathetic defence against the screaming, grinding and crunching of the drill bit as it fights its way into the rock, and water sprays from the stuttering machine. When the hole is finally deep enough, the crouching crew and Whitey move on to the next site. Talk of replacing these workers with machines suddenly seems ludicrous. This, I realise, is the only way to get gold out of the ground at this depth. Men, drilling machines and hard, hard labour under hundreds of tons of rock with the sweat pouring off their bodies in rivers. When the holes have been drilled, explosive charges are placed in them and stopped up. The area will be cleared, and the charges detonated. The blast will shatter the face of the panel, freeing shards of rock. That rock will be carried by people and machines to the surface where it will be crushed to free tiny bits of gold. To get to the panel, I had to put on safety gear: overalls, boots, knee guards, elbow guards, helmet, light and emergency breathing apparatus. Then I stood in a dark, rattling cage as it descended 1.7km down one shaft. After a short walk, I went into another cage and descended a further 1.8km. I realised that I had just travelled the same distance as my morning commute from Parkview to Rosebank through Joburg’s tree-lined streets. It seems ludicrous that I had travelled the same distance straight down into the earth in cages suspended on steel cables. About 3.5km underground, I had travelled a further 1.7km across on a rudimentary yellow rail car to arrive at the tunnels that wind their way to where Whitey is preparing the rock face for blasting. Along the way, blasts of cold air relayed down from the surface by giant refrigeration units fight against the mounting heat. Electrical and communications cables run along the rough walls covered in mesh to prevent rock falls. The tunnels are surprisingly brightly lit and well maintained. Every day about 10,000 litres of water are pumped out of the dolomite layer above the shafts at 48 pump stations to avert flooding. The object of all this engineering ingenuity, capital investment and hard labour can clearly be seen on the wall of the panel where the miners toil. Slithering its way down into the earth is a glittering seam of crushed pebbles and hardened organic matter -a cross-section of an ancient seabed compressed by centuries of pressure into gold-yielding ore. The glitter in the seam comes from the worthless mineral iron pyrites. But it is a clue that there is real gold lying hidden in dark veins of compressed organic matter which surround the compacted pebbles. Hundreds of millions of years ago, these pebbles were eroded, with the gold from volcanic rocks, and together with the gold were transported by turbulent rivers, before being deposited at the bottom of a large inland sea. They were covered by successive layers of sand, stone and lava. About 220-million years ago, a massive meteorite smashed into the Witwatersrand, tilting the reef so that one end rose to the surface, making its contents discoverable by people. South Africa’s ever-deepening gold mines are the result of the relentless quest to chase this and other seams lying parallel to it deeper and deeper into the earth. As this downward chase continued, it became more and more expensive to extract the rock, leading to more and more “marginal” mining operations where the rise and fall of the gold price determines whether or not it is viable to mine. The Driefontein mine is at the cutting edge of the debate on the future of mining. It has so far produced about 105million ounces of gold -worth about R1,4-trillion in today’s money. It has another 10 or 15 years of mining to go. It’s impossible to ask Whitey what he thinks of his job, but a short distance away in a waiting area I meet Theko Hafo, also a rock driller. He has spent much of his waking life in these tunnels deep under the earth. He comes from Lesotho, and has worked two other mines. He is 41, and seems physically slight for this type of work. Apart from the locals, there are workers from Mozambique, Swaziland, Lesotho and Botswana. “I get what I need for the job,” he tells me. His needs are simple — a modest house and schooling for his children. As I am accompanied by mine management it is perhaps not surprising that he has no criticism of the working conditions. Like the mines on the strike-bound platinum belt, the workers here are represented by the upstart union Amcu. I meet the local chairman, Thabang Molete, who is more candid. “We are not going to strike, but we are working hard and we earn nothing. We need a living wage,” he says. “I can’t send my child to university, I can’t buy a car. I work in a dangerous place,” he says, casting his eyes upwards at the threatening rock overhead. I ask him what he earns. “I get out R2,000,” he says. This is far below the lowest wage paid to miners — a figure that is hard to pin down as it depends on shifts worked and bonuses — but it is the all-important figure to a miner. The many deductions made by employers or, perhaps more tellingly, those due to garnishee orders that result from defaulting on microlending payments, are not considered part of the pay package. What counts is what the worker “gets out” — the cash that is left. That Amcu won’t strike at this mine, despite pleas from workers on the platinum belt for gold miners to express solidarity, suggests that the approach is different. The mine was unbundled from Gold Fields, which thought it was reaching the end of its life. That and a series of strikes seemed to have brought into question its viability. Its new owners, Sibanye Gold, have extended its life by radically cutting the cost of retrieving gold. Sibanye’s managers say they have sought to address worker demands for better conditions of employment by emphasising safety, building formal housing and paying bonuses to those who meet production and safety targets. For now, there is an uneasy peace on the gold mines while the platinum strike drags on. (Kitco News) - Silver market participants want to see an electronic auction-based silver fix as the new benchmark, according to survey results released Friday from the London Bullion Market Association. While organizations are still in the process of developing their price discovery systems, Kitco Metals Inc. recently launched a global silver fix price network. Kitco.com now publishes four fixing prices: 10 a.m. New York Silver Fix, 10 a.m. UK Silver Fix, the 10 a.m. Mumbai Silver Fix and the 10a.m. Hong Kong Silver Fix. John Dourekas, senior vice president of Kitco Labs, a division of Kitco Metals, said they developed the four fixing prices because they represent the largest precious-metals trading centers in the world. “Our new fixing network gives precious metal traders a geo-strategically balanced view of the global silver market,” he said. Not only has Kitco created an enhanced network but it also meets the criteria that silver market participants are looking for according to the LBMA survey results, Dourekas said. Dourekas said the Kitco fixing prices are derived from by a unique algorithm that averages the spot price between bid/offer on the wholesale silver market, as quoted by internationally recognized bullion dealers. The algorithm uses minimum present data points, and the price quotes come from anywhere from 10 to 30 international bullion dealers, he added. “Not only were we able to create a new method to determine the silver fixing, but we vigorously back-tested it against the current mechanism to validate the process,” he said. The LBMA also said its survey showed participants are looking for a new silver fix to be tradeable and with an increased number of direct participants. Companies have scrambled to create a new silver benchmark after the London Silver Market Fixing Ltd. Said earlier this year it would stop administering the London Silver Fixing as of Aug. 14. Although some analysts have said that the current price discovery mechanism is outdated, it is still widely used within the industry. According to the LBMA survey, of the 440 participants, 64% use the price fixing on a daily basis and 24% use it periodically. When rating the London price fix for usefulness, survey participants gave it a rating of 7.5 out of 10. While Kitco appears to be the first to publishing a new fixing price, they are not alone as a variety of different companies said they are in the process of creating a new pricing mechanism. Last week, the CME Group and the London Metal Exchange said they were working with the LBMA to create a new fixing process. Since then, Thomson Reuters and Platts have said they are also in talks with the association. On Wednesday, ETF Securities, which manages a variety of exchange-traded funds, said it is interested in creating a benchmark price. Although several firms said they are interested in creating a new silver fix, the LBMA survey showed only 25% of respondents said they would consider acting as a contributor; 31% said they might consider it. The LBMA is planning a seminar on June 20 to go over the results and get feedback from the association’s members. Dourekas said because Kitco.com is the world’s top-rated precious metals information website, the company believes that its market presence and platform can create the new global silver benchmark. 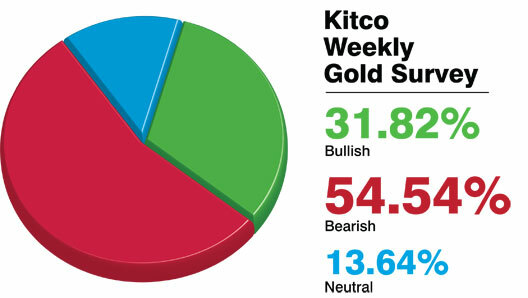 (Kitco News) - Participants in the weekly Kitco News Gold Survey are bearish on gold prices for next week, looking for a retest of recent lows. Out of 33 participants, 22 responded this week. Of those, 12 see prices lower, seven see prices higher and three see prices trading sideways or are neutral. Market participants include bullion dealers, investment banks, futures traders and technical-chart analysts. Last week, survey participants were slightly bearish for this week. As of 11:30 a.m. EDT, Comex August gold was up about $5 for the week. Those who see weaker prices said the downtrend in gold continues despite a rally Thursday, following the European Central Bank meeting. “I think we’re going to go back down. We had a little bit of a retracement here, a bounce off support. But I don’t see it holding. I think we go back to test support. The downtrend continues,” said Daniel Pavilonis, senior commodities broker with RJO Futures. Participants who look for higher prices said gold values in the short-term became oversold and the market is due for a bounce. President Barack “Obama’s rhetoric against Russia is heating up again, even as the violence in Ukraine is getting worse. That’s obviously positive for gold. And the ECB’s tepid stimulative measures are also positive since they demonstrate the lack of resolve on the part of the ECB; so far, it’s been all talk and very little action. These two developments against a gold price that had become short-term oversold, suggests a positive week or two,” said Adrian Day, chairman and chief executive officer of Adrian Day Asset Management. Those who see prices holding sideways said with the two major news events out of the way, the ECB meeting and the May nonfarm payrolls report, there’s little to stir the market. 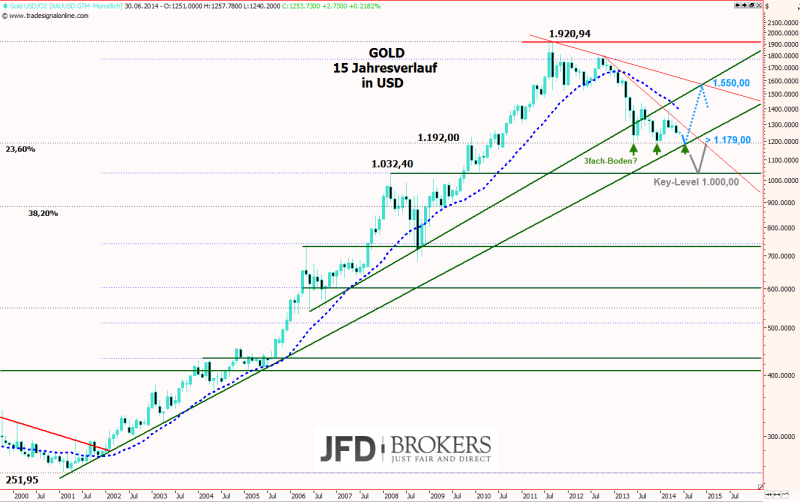 (Kitco News) - Gold market participants will keep an eye on the seemingly never-ending string of record highs in the stock market and technical-chart support levels next week, now that the European Central Bank meeting and the May U.S. jobs report are done. August gold futures fell Friday, settling at $1,252.50 an ounce on the Comex division of the New York Mercantile Exchange, up 0.52% on the week. July silver fell Friday, settling at $18.991 an ounce, up 1.65% on the week. In the Kitco News Gold Survey, out of 33 participants, 22 responded this week. Of those, 12 see prices lower, seven see prices higher and three see prices trading sideways or are neutral. 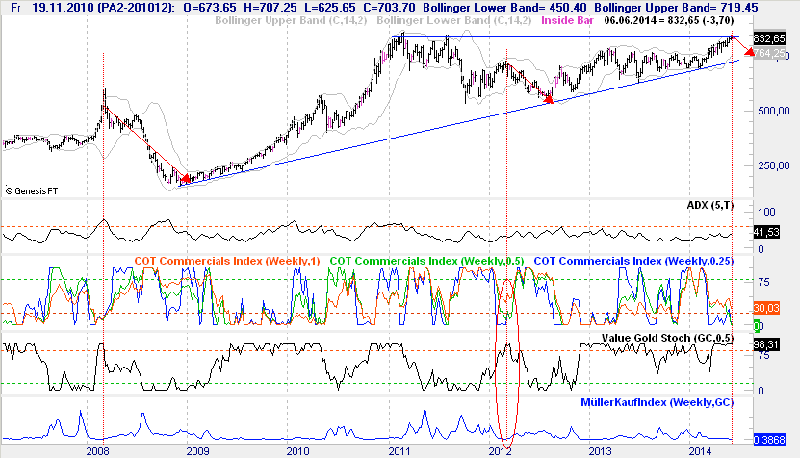 Market participants include bullion dealers, investment banks, futures traders and technical-chart analysts. Gold prices saw a mixed week of action, but with the market holding support in the low $1,240s area. Gold rallied after the ECB meeting and for a brief period following the release of the as-expected U.S. May nonfarm payrolls data, but the yellow metal struggled to hold the modest strength and slumped into the latter half of Friday’s North American session. Robin Bhar, head of metals research at Société Générale, said the activity in gold Thursday, after the ECB, and on Friday had the hallmarks of mostly short covering, rather than new buying. Short covering is the buying back of previously sold positions. Bhar said it’s likely that rallies in gold will be capped by traders looking to sell at higher levels, especially if the bounces are because of short covering. “Short covering rallies aren’t sustainable because once it’s over (there’s nothing left to keep prices supported). You need to have new buying to come in,” he said. Gold prices saw mixed reaction to an as-expected U.S. nonfarm payrolls report. The Labor Department said the U.S. added 217,000 jobs in May, with the jobless rate unchanged at 6.3%. Consensus estimates for the report suggest between 210,000 to 215,000 jobs were created. The Labor Department modestly eased April’s job growth to 282,000 new jobs versus the 288,000 originally stated. March's job growth of 203,000 was unchanged. Meanwhile Standard & Poor’s 500 stock index futures scratched out another round of new record highs after the data. 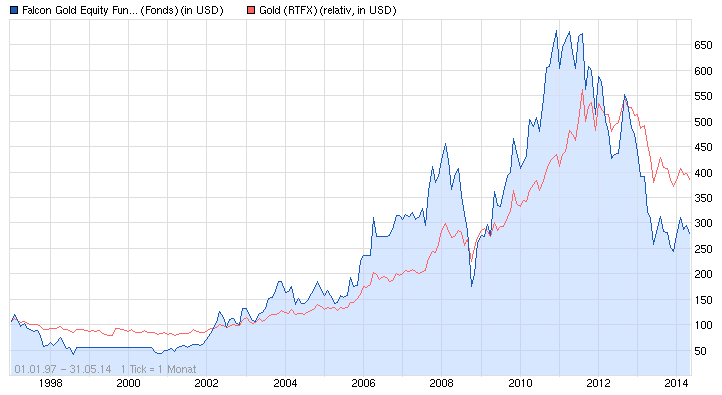 Several gold-market watchers said the continued strength of the equities market has driven interest out of gold. That could weigh on the metal next week as the major planned news events are done and next week’s U.S. economic calendar is light. “In an environment of rising U.S. real yields, fresh highs in the S&P500 and a stronger U.S. dollar we still view the gold price outlook as bearish,” said Michael Lewis, analyst at Deutsche Bank. Adam Klopfeinstein, market strategist with Archer Financial Services, said he can’t get bullish on gold until equities start to weaken. “I don’t see how the market holds here... The flight-to-quality and the inflation people are throwing in the towel. The stock market is taking them away. Bond yields were falling, but I think that’s done. Gold is going to stay weak as long as stocks hold up. But I think stocks are in their last bit of gains… Once stocks correct gold may go higher,” Klopfeinstein said. Ira Epstein, of the Ira Epstein division of the Linn Group, said it’s hard to be bullish on gold until late June/early July, based historical price patterns. “That doesn’t mean that serious bounce can’t and don’t occur. They do if you study the chart, but overall prices tend to work lower into late June,” he said. Since gold could not take out resistance at $1,260 this week, technical-chart analysts said bears may try to break through this week’s support around $1,240 in attempt to push to the major chart support around $1,225 from January. Epstein said he is also keeping an eye on the outside day up gold posted Thursday. An outside day up is a technical chart move where the market action takes out the previous day’s low and high and closes higher on the day. That could mean further gains near-term. “I have a trading rule that I formed over the years that I like. Simply put, when you have an outside day up, the low of that day should not be taken out within the next two trading sessions. If taken out I label that a ‘bull trap’ and expect prices to work lower,” he said. El Nino Is Coming: Time To Buy Gold? What does an above-normal warming in the Pacific Ocean equatorial waters off the coast of South America have to do with gold? At first glance. Nothing. But, the global weather phenomenon known as El Nino is brewing and some meteorologists place high odds that it will officially develop this year. The last El Nino event occurred in 2009 and this year scientists are already seeing ocean waters temperature climb to above normal levels. It will take several months before the NOAA (National Oceanic And Atmospheric Administration) declares an official El Nino event —due to their strict scientific definition. But, it may already be underway. Drew Lerner, senior agricultural meteorologist at Kansas-based World Weather Inc., estimates 80-85% odds that an El Nino event will impact global weather patterns this year. "The El Nino impact on world weather is already underway," Lerner said pointing to an already delayed start to the monsoon season in India. Africa, Northern South America, Southeast Asia, Thailand, Vietnam and India to name a few. Again, what does weather have to do with gold? Well, Jodie Gunzberg, global head of commodities at S&P Dow Jones Indices ran some numbers looking back at eight historical El Nino events since 1983. "The metals showed positive performance in most of the periods with average returns of 25.3% and 8.9% from industrial metals and precious metals, respectively," Gunzberg wrote in a research note. The metals returns were measured via the S&P GSCI Industrial Metals and S&P GSCI Precious Metals indices. Sound strange? Maybe not. El Nino years are associated with drought—though they don't always correlate to actual drought years. But, El Nino events do have potential to impact a wide range of global agricultural production. If weather disrupts crop production, prices go up, and that, of course, is inflationary. Metals are a traditional hedge against inflation. Während der letzten Woche bebte die Erde aller Edelmetallfans aufgrund der starken Rücksetzer beim Gold wie auch Silber. Die charttechnische Situation hat sich in Folge dessen schlagartig eingetrübt und doch setzten sich die Abgaben in dieser Größenordnung während der aktuellen und bald endenden Handelswoche nicht weiter fort. Der vorhin veröffentlichte US-Arbeitsmarktbericht übte zunächst keinen großen Einfluss aus, doch seit wenigen Minuten knickt der Goldpreis wieder ein, so dass man sich durchaus die getitelte Frage in Sachen weiterer Preisentwicklung stellen darf. Die Sommermonate liegen voraus und neben einer durchaus zu erwartenden Lethargie weist auch die Saisonale Tendenz der letzten rund 15 Jahre auf eine ebensolches Tauziehen zwischen Bullen und Bären im Hinblick der kommenden 60 Handelstage hin. Wie ist hierbei eigentlich Ihre Einschätzung? Diskutieren Sie rund um den Devisen- und Edelmetallhandel hier im Guidants-FX-Live-Stream mit. Man könnte nunmehr meinen, dass das Schlimmste überstanden sei. Doch unter der charttechnischen Brille betrachtet fehlt beim Gold ein klarer Boden und auch die Stabilisierungsversuche von Silber um 18,90 USD können nicht wirklich überzeugen. Ist die übergeordnete Edelmetall-Rally nunmehr vorbei? Zweifelsfrei können weitere Verluste nicht ausgeschlossen werden und so wollen wir uns heute dem Big Picture Chart des Goldpreises auf Monatsbasis seit Beginn der Rally zum Millennium widmen. Vorab jedoch noch ein paar Fakten am Rande. Dass China nicht mehr zu den Emerging Markets zählt dürfte wohl nunmehr auch dem letzten Investor klar geworden sein. Interessant dabei die Tatsache, dass im Anschluss des Besuchs des chinesischen Präsidenten Xi Jinping vor ein paar Wochen in Deutschland, die Absicht der Eröffnung einer Clearing Stelle für den Handel mit der chinesischen Währung Yuan bekanntgegeben wurde - EUR/CNY (Euro-Renminbi Yuan-Kurs). Sofern es dazu kommt, wäre Deutschland einer der zentralen Handelsplätze in der Eurozone. Zwar ist der Yuan noch nicht frei konvertibel, doch lässt sich eine zunehmende Absicht nicht bestreiten. Doch was hat dies eigentlich mit dem Goldpreis zu tun? Die Öffnung Chinas im Sinne währungspolitischer Maßnahmen hat natürlich indirekte Auswirkungen auf den Goldpreis. Denn faktisch stehen rund 30% der Währungsreserven der Welt unter chinesischer Kontrolle und die Umverteilung dieser, gerade auch in Bezug zum Goldpreis selbst steht hier im Fokus. Zudem dürfte sich das langfristige Ziel den Yuan zu einer Leitwährung zu machen und auch durch eine Art Golddeckung - zumindest zu teilen - stabiler als die übrigen Währungen der Welt erscheinen zu lassen, nur positiv auswirken. Die Aussagen der Zentralbank offiziell kein Gold nachzufragen erscheint hierbei eine Art Taktik zu sein, um letztlich doch "unter der Hand" fleißig einzukaufen. Der stete Ausbau der Goldreserven ist längst kein Geheimnis mehr und auch das China mittlerweile Indien in Sachen Nachfrage überholt hat. Der Aufruf des Staatsfernsehens im Jahr 2009, das Volk zum Edelmetalleinkauf zu motivieren, unterstreicht diese Annahme des Ausbaus nicht minder. Faktisch ist Gold allein unter diesen Umständen auf der Südseite vor einer Umkehr des übergeordneten Aufwärtsimpulses geschützt. Die nachfolgende Grafik von Zero Hedge verdeutlicht dabei den Hunger Chinas, da die heimische Produktion für die hohe Nachfrage längst nicht ausreicht. So sind vom September 2011 bis Oktober 2013 allein 2.380 Tonnen(!) 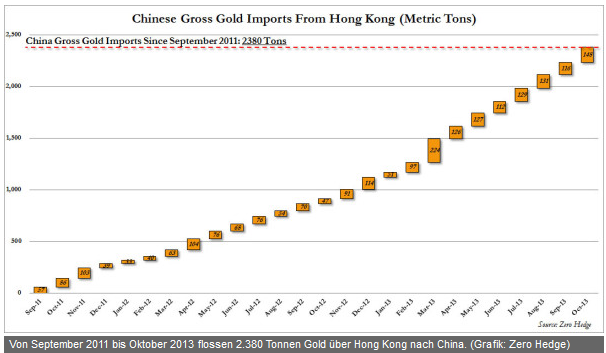 Gold über Hong Kong nach China eingeführt worden. Doch was bedeutet dies nun im Kontext für den Anleger. Betrachten wir daher den bereits angekündigten Langfrischart des Goldpreises. Anmerkung am Rande. In der kommenden Woche wird hier an dieser Stelle das goldgelbe Edelmetall in verschiedenen Währungen charttechnisch ausgewertet werden. Doch heute gehört dem Goldpreis je Unze in U.S. Dollar die Bühne. Nachfolgender Montatschart zeigt hier in der logarithmischen Skalierung den klaren und noch immer intakten Aufwärtstrend seit dem Jahr 2001. Die hierbei primäre Trendlinie verläuft knapp unter dem Bereich des 23,60%-Fibonacci-Retracements der zehnjährigen Aufwärtsbewegung von 2001 bis 2011. Dieses Level befindet sich um 1.192,00 USD und genau dort drehte der Goldpreis bereits zweimal auf Monatsbasis wieder nach oben. 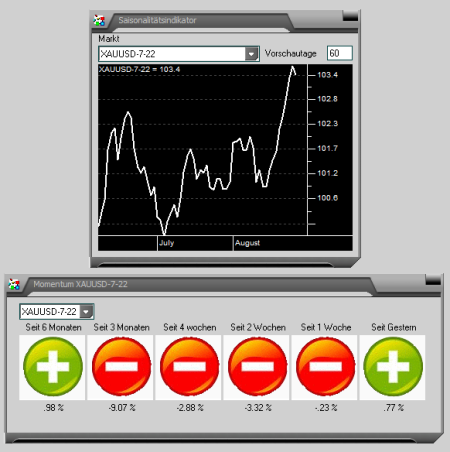 Ein dritter und durchaus wahrscheinlicher Test dieses Levels könnte uns nach einer kleinen Erholung bis maximal 1.300,00 USD bevorstehen. Die kommenden Wochen dürften also turbulent bleiben und doch besitzt Gold im Anschluss an einen dritten Test dieses bereits zweimal erfolgreich getesteten Unterstützungslevels, in Verbindung des Touchs der langfristigen Aufwärtstrendlinie, die Chance einen stabilen Dreifachboden zu vollenden. Sollte es im Anschluss noch zum Ausbruch über die sekundäre und seit Ende 2012 ausgebildete Abwärtstrendlinie kommen, so wäre bei Preisen über 1.300,00 USD eine nachfolgende Aufwärtsbewegung bis rund 1.550,00 USD keine Überraschung, bevor im Anschluss bei einem Ausbruch über 1.550,00 USD die Abwärtstrendlinie seit dem Rekordhoch von 1.920,94 USD unter Beschuss stehen dürfte. Eine gegenteilige Entwicklung dürfte sich hingegen bei einer Fortführung der Schwäche und einem dementsprechenden Ausbruch unter 1.179,00 USD per Monatsschluss manifestieren. In diesem Fall müsste man durchaus einen Test der runden Marke von 1.000,00 USD je Unze einplanen. Der Chart hätte in diesem Fall deutliche Schlagseite zu verzeichnen und ein zäher Kampf der Bullen und Bären um diese psychologisch runde Preismarke herum dürfte die kommende Zeit prägen. Ob hierbei die erhöhte Nachfrage aus Fernost den Sieg der Bullen herbeiführen kann, bleibt bis dato abzuwarten. Südafrikas Platinminenstreik - Ende in Sicht? Südafrikas neuer Bergbauminister Ngoako Ramatlhodi hat Mineweb zufolge mitgeteilt, dass er ein Ende der Streiks im Platinsektor noch diese Woche für möglich hält. In dem am Mittwoch erschienenen Artikel hieß es weiter, dass auch die Gewerkschaft AMCU ein baldiges Ende des fünfmonatigen Stillstandes im Bereich des Möglichen sehe. Im Januar hatten 70.000 AMCU-Mitglieder ihre Arbeiten in den Minen von Impala Platinum, Anglo American Platinum und Lonmin niedergelegt. Daraufhin sei die globale Produktion um 40% eingebrochen. Am Dienstag habe sich ein Team des Ministers mit der AMCU getroffen und einen Tag später mit den Vorständen der drei Platinunternehmen. Die Gespräche seien dabei gut verlaufen, was auch vonseiten des AMCU-Präsidenten bestätigt worden sei. Eine Zeitung habe sogar mitgeteilt, dass die Gewerkschaft einem Lohnangebot der Regierung zugestimmt habe. Dieses sei nur unwesentlich geringer als die Forderung der AMCU, welche selbige als "lebensnotwendigen Mindestlohn" bezeichne. 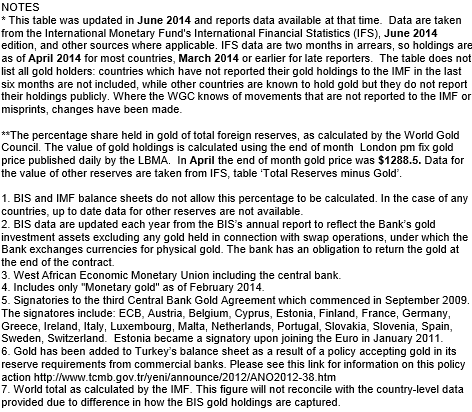 Das World Gold Council (WGC) veröffentlichte gestern die aktuellen Zahlen zu den offiziellen Goldreserven weltweit. 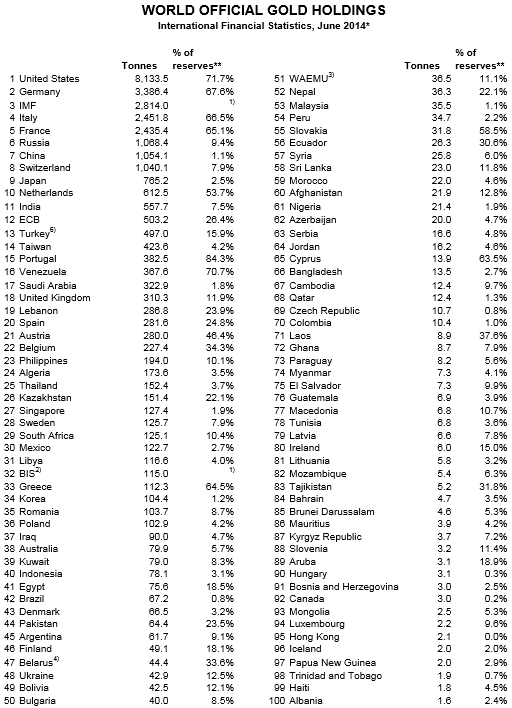 Über die größten Bestände verfügen den Daten zufolge mit 8.133,5 Tonnen nach wie vor die USA. Der Anteil der Währungsreserven beläuft sich derzeit auf 71,7%. Mit deutlichem Abstand folgt Deutschland, dessen Goldreserven sich auf 3.386,4 Tonnen belaufen. Hier liegt der Anteil an den Währungsreserven aktuell bei 67,6%. Die Goldbestände der Türkei erhöhten sich unterdessen um 13,4 Tonnen auf 497,0 Tonnen. Kasachstan erwarb 2,7 Tonnen des Edelmetalls und die Ukraine 0,3 Tonnen. Einzig die Goldreserven Mexikos und Maltas verringerten sich im April um jeweils 0,1 Tonnen. Weiterhin hat der Irak einen deutlichen Anstieg seiner Goldbestände um 47,8 Tonnen gemeldet. Nähere Informationen über den genauen Zeitpunkt der Erhöhung liegen dem WGC nach eigener Aussage zum aktuellen Zeitpunkt nicht vor. Mit 90,0 Tonnen rangiert der Irak nach jüngstem Stand damit hinter Polen auf Platz 37 und lässt damit Australien hinter sich. Einer der größten Anbieter von ETFs habe sich jetzt ebenfalls an dem Rennen um einen neuen Silberkurs-Benchmark eingeschaltet, berichtete die Financial Times am Mittwoch. ETF Securities habe demzufolge der London Bullion Market Association ein Angebot gemacht und würde auch Marktteilnehmer konsultieren. Grund dafür ist, dass am 14. August das 117 Jahre alte Londoner Silber-Fixing abgeschafft werden soll. Der Schritt des Unternehmens, das als erstes goldgedeckte ETFs anbot und 19 Mrd. $ beaufsichtigt, verdeutliche den enormen Konkurrenzkampf um die Bereitstellung des täglichen Referenzpreises. Neben dem britischen Unternehmen würde so beispielsweise die London Metal Exchange, die weltgrößte Börse für Basismetall-Futures und früher für die Festlegung des Silberkurs verantwortlich, an einer eigenen elektronischen Alternative arbeiten. Ebenso die Chicago Mercantile Exchange, welche die größten Silber- und Goldderivate beaufsichtigt. Am Mittwoch habe auch der Benchmark- und Informationsanbieter Platts bestätigt, in die Diskussion eingestiegen zu sein. Quellen zufolge sei auch Thomson Reuters an der Bereitstellung eines Silberkurses interessiert. Die Organisation, auf die schließlich die Wahl fällt, befinde sich außerdem in der besten Position, das in Verruf geratene Gold-Fixing zu übernehmen, sollten die daran beteiligten Banken sich schließlich entscheiden, dieses aufzugeben. Darüber hinaus biete die Beteiligung an solch einem Preisfindungsprozess auch Prestige und steigende Einnahmen durch Transaktionsgebühren und ähnliches. Nach Gesprächen mit Marktteilnehmern habe sich ETF Securities zu einer Methode entschlossen, bei welcher die Anteilauktionsplattform der London Stock Exchange genutzt werde und deren Ergebnis physisch beglichene Transaktionen seien. Grundlage wäre der an der London Stock Exchange gehandelte, physisch gedeckte Silberfonds des Unternehmens. Aufgrund der so erzielten realen Transparenz und der bereits vorhandenen Infrastruktur sehe man dies als bestes Angebot, das höchstwahrscheinlich von der LBMA akzeptiert werde. Derzeit halten drei Banken eine Auktion per Telefonkonferenz ab, was in der jüngsten Vergangenheit jedoch gemeinsam mit dem ähnlich ablaufenden Gold-Fixing wiederholt als undurchsichtig und überholt kritisiert worden ist. Als nach vermehrten Untersuchungen durch Aufsichtsbehörden die Deutsche Bank ihren Platz im Gold- und Silber-Fixing schließlich aufgab, aber keinen Käufer finden konnte, wurde das Ende der Londoner Silberpreisfestlegung beschlossen. Daraufhin habe die LBMA im Mai mit Beratungen über ein neues Preisfindungssystem begonnen. Das Bergbauministerium Südafrikas warnte am Donnerstag davor, dass eine Streikerlaubnis für die AMCU im Goldminensektor die Produzenten schwer treffen würde. Wie BusinessDay am Freitag mitteilte, würde eine anhaltende Arbeitsniederlegung im Goldsektor wesentlich schwerwiegendere Auswirkungen haben als im Platinsektor. Der Grund seien die allgemein niedrigeren Gewinnmargen. Am Freitag wolle die AMCU erneut vor Gericht gegen das Verbot vorgehen, laut dem die Arbeiter im Goldminensektor nicht für einen Mindestlohn von 12.500 Rand streiken dürften. Während die Gewerkschaft am Donnerstag vor Gericht war, hätten sich die drei größten Platinproduzenten Südafrikas zum zweiten Mal mit einem Problemlösungsteam der Regierung getroffen, um die anhaltenden Streiks in diesem Sektor zu beenden. Da die AMCU noch keine Nachricht erhalten habe, sei es ungewiss, ob die Gespräche einen weiteren Tag dauern könnten. Auch wenn die AMCU die Gespräche mit den Produzenten und die Bemühungen der Regierung als positiv ansehe, bestünde die Vermutung, dass die Gewerkschaft vor einer Einigung zunächst auf den Ausgang bezüglich einer Erlaubnis für Goldminenstreiks warten werde. In diesem Sektor wären die Gewinnmargen noch geringer als bei den Platinproduzenten, von denen fast die Hälfte schon vor dem anhaltenden Streik Verluste verzeichnet hätte. Daher wäre ein Streik im Goldsektor nahezu vernichtend und unmöglich über eine mit den Streiks bei den Platinminen vergleichbare Dauer auszuhalten. Eine goldene Visa zu besitzen, könnte bald ein ganz neue Bedeutung erhalten - denn die Bank IMGold von der Isle of Man werde bald die erste Massivgold-Kreditkarte anbieten, die zudem von dem physischen Metall selbst gedeckt sein werde. Besitzer von Barren im Wert von mindestens 100.000 Pfund in den Tresoren der Bank könnten einem Bericht der Financial Times zufolge die 14-Karat-Karte beantragen. Als Sicherheit würde dann das Edelmetall dienen, eine Plastikversion sei aber ebenfalls möglich. Dadurch müssten Edelmetallbesitzer ihr Gold nicht länger verkaufen, um Zugang zu Bargeld zu erhalten. Der Zinssatz der im Laufe des Jahres verfügbaren Karte werde aufgrund der Sicherheit des Goldes vermutlich unter 10% liegen. Bislang wären wiederholte Versuche einer physisch gedeckten Kreditkarte gescheitert, da Befürworter des Goldstandards lieber das Metall besitzen und Währungen ausgeben würden, als andersherum. Trotz niedriger Transaktionsgebühren sei die Mobilisierung bestehender Goldbestände nur interessant, wenn die Kosten unter den üblichen Beleihungsgebühren liegen würden. Der Besitz von physischem Gold sei für viele Investoren interessant, da sie ihr Gold gegebenenfalls "besuchen" könnten. Man hoffe nun, weitere Kunden anzulocken, indem man es als Kreditsicherheit anbiete. Massivgold-Kreditkarten gäbe es bereits von mehreren Banken, bislang werde aber keine von dem Metall selbst gedeckt. So habe das russische Unternehmen, welches von IMGold beauftragt worden sei, schon einige Goldkarten produziert. 2012 habe die Sberbank in Kasachstan die erste Kreditkarte aus dem gelben Metall herausgegeben, die zudem mit 26 Diamanten bestückt sei und ein Perlmutt-Inlay besitze. Ein Jahr später sei eine andere Bank des Landes dem Beispiel gefolgt. Erst kürzlich habe eine Bank in Saudi Arabien die erste vergoldete World Elite MasterCard ausgegeben. Auch zwei Banken in Katar würden vergleichbare Karten anbieten. Wie so oft in den vergangenen Jahren habe ich damit einmal mehr einen sehr guten Grund, das von Jean-Claude Juncker in seiner Zeit als Euro-Gruppenchef im April 2011 öffentlich ausgesprochene Credo der EU-Elite zu zitieren: "Wenn es ernst wird, muss man lügen." In den Fängen dunkler Mächte? Aber vielleicht tue ich Herrn Draghi ja Unrecht. Vielleicht möchte er uns ja durch die Blume eine ganz andere Botschaft übermitteln. Vielleicht wollen er und seine Zentralbankkollegen die Sparer ja wirklich nicht enteignen, sondern werden von dunklen Mächten, die wir Normalsterblichen nicht sehen können, dazu gezwungen. In diesem Fall hätten wir es natürlich nicht mit einer dreisten Lüge zu tun, sondern mit einer Notlüge - und einem schweren Fall von Verfolgungswahn. Für Sie als Sparer und Anleger spielt es allerdings keine Rolle, was Draghi und seine Gelddrucker-Gang antreibt. Sie müssen sich einzig und allein um die Folgen seiner Politik sorgen. Und diese Folgen werden verheerend sein. "Der Zins hat bereits seine Signal- und Steuerfunktion verloren. Die Finanzmärkte sind durch die Zentralbankinterventionen und die gegebenen Garantien völlig verzerrt. Risiken werden nicht mehr richtig abgebildet." Mit anderen Worten, die Zentralbankbürokraten haben erneut eine gewaltige Spekulationsblase, eine umfassende Blasenökonomie geschaffen. Und was nach dem Platzen der Blase passieren wird, das kennen Sie ja schon aus den Jahren 2000 bis 2003 und 2007 bis 2009. Allerdings sind die Ungleichgewichte und Fehlentwicklungen heute noch wesentlich größer als damals. Deshalb muss man befürchten, dass auch die unvermeidliche Anpassungs- und Bereinigungskrise heftiger ausfallen wird als damals. Schön, dass sogar ehemalige Zentralbanker das inzwischen so sehen. Allerdings wagen sie es noch immer nicht, den Gedanken konsequent zu Ende zu denken. Wenn sie das täten, müssten sie nämlich die Abschaffung des Zentralbankwesens und des untrennbar mit diesem verbundenen staatlichen Geldmonopols fordern. Vor blutrünstigen Vampiren kann man sich angeblich mit silbernen Gewehrkugeln schützen. Vor wild gewordenen Zentralbankbürokraten schützt man sich am besten mit Gold. DAX 10.000: Jetzt sorgt die Spekulationsblase für euphorische Berichterstattung. Ein Sturm der Entrüstung bleibt dennoch aus. Die Massenmedien unterstützen diese Politik, für die unsere in der DDR groß gewordene Kanzlerin den Begriff der "Alternativlosigkeit" geprägt hat, mit dem sie jede Diskussion ersticken will. Dabei müsste doch gerade sie schon aufgrund ihrer Herkunft wissen, dass es zum Sozialismus eine sehr verlockende Alternative gibt. Und wir im Westen sollten uns daran erinnern, dass diese Alternative, die Marktwirtschaft, den großen Wohlstand breiter Schichten überhaupt erst möglich gemacht hat. Während die Medien die Spekulationsblase an den Aktienmärkten völlig unkritisch feiern, mehren sich die Zeichen, die für ein baldiges Platzen der Blase sprechen. Der DAX hat auf die gestern beschlossenen sehr weitreichenden Maßnahmen der EZB sehr verhalten reagiert und nicht mit der von vielen erwarteten fulminanten Rally. Ein Börsenhändler kommentierte die Entscheidung der EZB mit folgenden Worten: "Draghi schießt aus vollen Rohren. Das ist mehr als die Dicke Berta. Es muss schlimm um die Euro-Zone stehen, wenn so viel Geld reingepumpt werden muss." Dem habe ich nichts mehr hinzuzufügen, ziehe aber meine Konsequenzen. In unserem Börsenbrief Krisensicher Investieren haben wir bereits damit begonnen, erste Short-Positionen aufzubauen, mit denen unsere Leser von fallenden Aktienkursen profitieren. Ganz aktuell hat ein kurzfristig orientierter Indikator, der auf dem Volatilitätsindex basiert, ein doppeltes Verkaufssignal gegeben. In meinem morgen erscheinenden Krisensicher Investieren Wochenupdate werde ich dieses Signal besprechen und darauf basierend konkrete Handlungsempfehlungen geben. Handeln Sie, bevor es zu spät ist. Testen Sie Krisensicher Investieren jetzt 30 Tage kostenlos. Sie können nur gewinnen. Über den starken Preisrückgang von Gold seit April 2013 wurde viel berichtet - vor allem in Form Prognosen zu neuen Tiefständen und einem Ende des Bullenmarktes. Auffälliger Weise wurde dabei wenig Bezug auf die physischen Angebot-und-Nachfrage-Grundlagen genommen, die ein anderes Bild zeichnen als die Bewegungen auf dem Papiergoldmarkt glauben lassen würden. • Grund 1: Der Bevölkerungsanteil der Mittelschicht sinkt in den USA und Europa kontinuierlich, während er in Indien und China höchstwahrscheinlich in enormem Maße weiterwachsen wird. • Grund 2: Bereits jetzt ist die chinesische Mittelklasse fast so groß wie die gesamte Bevölkerung der USA. • Grund 3: Von 2011 bis 2016 könnte die indische Mittelschicht um 67% wachsen - ein Zeichen für die Verschiebung des Wohlstands nach Osten und damit hin zu goldliebenden Konsumenten. • Grund 4: Waren Indien und China 2002 nur für 23% der globalen Goldnachfrage verantwortlich, so hatte sich diese Zahl bis 2012 mehr als verdoppelt auf 47%; Tendenz: weiter steigend. 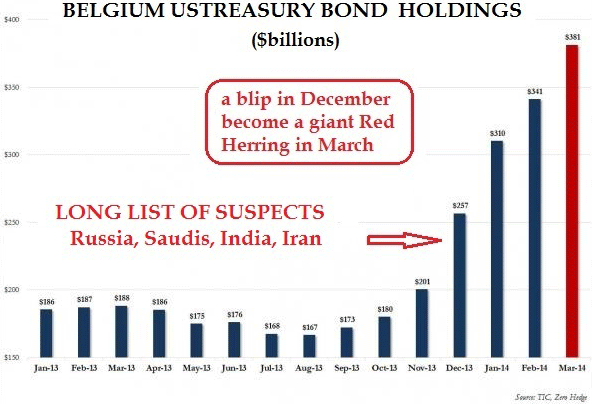 • Grund 5: Bereits 2013 habe die indische und chinesische Nachfrage mehr als die Hälfte der weltweiten Goldnachfrage ausgemacht - die der USA habe lediglich ein Neuntel der Nachfrage dieser beiden Nationen betragen. • Grund 6: In deutlichem Gegensatz dazu hat die Menge neuer Goldfunde ein Rekordtief erreicht. Während die Nachfrage in den letzten 10 Jahren um 42% gestiegen ist, blieb das Angebot nahezu unverändert. Und wurden in den 1990ern jährlich noch etwa 100 Mio. Unzen entdeckt, sank die Zahl in den zehn Jahren bis 2011 auf nur noch 30 Mio. Unzen. • Grund 7: Die Entdeckungen zwischen 2007 und 2011 können nur etwa 56% des tatsächlich in diesem Zeitraum abgebauten Goldes wettmachen. Die aufgrund der niedrigen Goldpreise erfolgten Einsparmaßnahmen seitens der Bergbauunternehmen werden zusätzlich zum Angebotsmangel beitragen. Und ein weiteres Risiko stellen neue Entdeckungen in geopolitisch riskanten Regionen dar. • Grund 8: Der durchschnittliche Goldgehalt sank zwischen 2005 und 2011 um 23%. Bei den zehn größten Goldabbauunternehmungen sogar um 75% im Zeitraum von 1998 bis 2012. • Grund 9: Das "einfache" Gold wurde bereits abgebaut und daher werden die gesamten Cashkosten in Verbindung mit den sinkenden Gehalten und steigenden Produktionskosten gefährlich nahe der tatsächlichen Goldpreise liegen. Im Zuge dessen wird die Produktion vermutlich weiter zurückgehen. • Grund 10: Zwischen 2008 und 2012 konnten nur vier Entdeckungen mit mehr als 3 Mio. Unzen Gold gemacht werden. Und trotz Rekordausgaben für die Exploration 2012 erreichten die neuen Entdeckungen den niedrigsten Stand seit mehr als 40 Jahren. Die Entdeckung, dass die US-Staatsanleihebestände in den offiziellen Bilanzen der belgischen Zentralbank ansteigen, sorgt für großes und tiefes Misstrauen. Hier zeigt sich endlich eine offene Wunde, die sich nicht so einfach wegerklären lässt. Vor einigen Monaten waren diese Entwicklungen zum ersten Mal zu beobachten. Die Kurzschlussinterpretation lautete damals, dass hier inoffizielle Zusammenarbeit zwischen US Fed und der EuroZentralbank vorläge, mit der umfangreiche, heftige Anleihemonetsierungskäufe in New York versteckt werden sollten - was in der Tat Jackass‘ Argument stützte, dass das QE-Volumen in Wirklichkeit gewaltig ist und dass Bernanke und Yellen gerissene Lügner und Täuscher waren und sind. Der nächste Anhaltspunkt deutete auf Russland hin, das - unter Benutzung der und auf dem Umweg über die EuroClearingsstelle - mit umfangreichen US-Staatsanleiheausverkäufen begonnen hatte. All das ergab so viel Sinn: Die russische Bilanz war ungefähr im selben Umfang geschrumpft, wie die belgischen Bilanzen anwuchsen, wobei man auch wissen sollte, dass das winzige Belgien ein eher beachtliches Leistungsbilanzdefizit ausweist und keine überschüssigen Kapitalmengen für derartige Investitionen zur Verfügung hat. Belgiens BIP liegt bei 480 Mrd. $ - und der Umfang der zu beobachten Kapitalbeule ist bald schon so groß wie die Gesamtwirtschaftsleistung des Landes. Der Hauptexport des Landes ist eng verknüpft mit der heißen Luft, die aus der europäischen Kommission und dem EU-Parlament ausströmt - und keine beider Institutionen besitzt ein Fünkchen globaler Integrität. Man muss sich die Frage stellen, ob hier nicht eine geheime Partei im Verschrottungsprozess auf die russische Seite gewechselt ist. Es könnte sein, dass ein verärgertes Saudi-Arabien sich entschieden hat, große Ladungen US-Staatsanleihen loszuwerden; oder vielleicht der Iran mit einem Flankenangriff in einem neuen Finanzkrieg. Vielleicht treibt sogar China, mithilfe des Hongkong-Fensters, einen Umkehrfluss voran - wobei physisches Gold zuströmt und US-Staatsanleihen als Bezahlung ausströmen. Mit der Gutheißung von QE 3 und der Tapering-Fiktion befand sich das Dollar-Imperium schon im mittleren Zusammenbruchstadium - gestützt von kreativen Lügen. Die Belgische Beule kann jetzt als Zeichen für das Erreichen der Spätphase des Zusammenbruchs betrachtet werden. Der Spielverlauf ändert sich rapide - im Geldkrieg kommen große versteckte Kanäle zum Einsatz. Motive sind leicht auszumachen. Russland stellt sich den Sanktionen und zieht Kapital, angesichts eingefrorener Konten und blockierter Kanäle, ab. Die Saudis gehören jetzt zu den neu bestimmten Staatsfeinden der Vereinigten Staaten, welche es schon immer bevorzugten, gleich eine ganze Liste mit Feindesstaaten parat haben, um die faschistische Kriegsmaschine weiterbrummen zu lassen. Es ist möglich, dass die Saudis große US-Staatsanleihetranchen abstoßen, nachdem sie erfuhren, dass die Londoner Banker ihr Gold stehlen. Es ist nicht ganz unanrüchig, wie in letzter Zeit Banken wie Credit Suisse und selbst BNP Parisbas zum Schuldeingeständnis gedrängt wurden. Die US-Regierung forciert Fusionen jeweils mit UBS und Societe Generale, welche wahrscheinlich die Plünderung saudischer Goldkonten erleichtern werden - eine faschistische US-Spezialität. Die ultimative Rache der Saudis wird Deinvestion bei US-Staatsanleihen und die gänzliche Preisgabe des US-Dollars sein - gefolgt von einer gänzlichen Annahme des chinesischen Yuan und der chinesischen Protektoratsrolle. Die Saudis werden bald schon bei der US-Dollar-Bindung der Ölexporte nicht mehr konform gehen. Der gesamte OPEC-Block wird sich dem verheerenden Schlag gegen den US-Dollar anschließen. Der später folgende finale Schlag aus dieser Weltregion wäre dann die Herausbildung und schließlich Lancierung des goldgedeckten Golf-Dinars. Diese Schritte würden allesamt als Kriegserklärung gegen US-Interessen (so der allgemein gebräuchliche Terminus!) betrachtet werden. Der Tod des Petro-Dollars könnte einen Saudi-Fingerabdruck in Belgien hinterlassen haben. Man bedenke aber auch, wie offensichtlich die Belgische Beule ist - also der Anstieg der US-Staatsanleihebestände des Landes im November 2013 und dann ganz unmissverständlich im Dezember 2013 (Anstieg auf 257 Mrd. $). Und dann ein gigantischer roter Balken (der Aufmerksamkeit auf sich zieht) im März mit 381 Mrd. $. Wird nun auch noch die Schwelle der halben Billion $ überstiegen, müsste man davon ausgehen, dass diese Angelegenheit vielleicht noch zu einer kontrovers diskutierten Tagesdebatte wird. "Die Revolte in Kiew im Februar 2014 ging vom ukrainischen Volk selbst aus, eine Art zivilisatorisches Phänomen, dessen Ausgangspunkt kein politisches Projekt war." In der aktuellen Ausgabe des Smart Investor Magazines (6/2014) wird auf den Seiten 62/63 Palladium als Investment empfohlen. In den abschliessenden beiden Absätzen dieses Artikels werden der Palladium ETF der Zürcher Kantonalbank (A0MQZN), der ETFS Physical Palladium von ETF Securities (A0N62E), sowie ein Lieferant für Technologiemetalle, als Kaufoptionen für physisches Palladium empfohlen. Ich möchte diese aus meiner Sicht suboptimalen Kaufempfehlungen zum Anlass nehmen, eine Empfehlung zu erneuern, die ich bereits seit Jahren gebe und die sich mehr und mehr als richtig herausstellt. Zunächst sei jedoch darauf verwiesen, dass die kommerziellen Händler an der Comex derzeit leider ein anderes Bild von Palladium zeichnen. Der Kurs ist, sieht man von dem spekulativen Hype ab, der im Februar 2001 zu einer Spitze von 1.090 Dollar/Unze führte (1.460 Dollar des Jahrganges 2014; Quelle: Offizieller US Inflation Calculator), an einem Widerstand angekommen, der von den Hochs im Februar und im August 2011 definiert wird, siehe Abb. 1. Gegenüber Gold ist Palladium hoch bewertet (in Abb. 1 "Value Gold Stoch") und auch die Commercials an der Comex setzen auf einen fallenden Kurs (niedriger "COT Commercials Index"). Wenn der Streik in Südafrika geschlichtet ist, sollte es also zumindest bis ca. 720 Dollar nach unten gehen (untere Unterstützung, siehe rechter roter Pfeil in Abb. 1). Auch mein KaufIndex, der ein Kondensat aus klassischen Indikatoren und den CoT-Daten darstellt, ist auf einem Wert nahe Null (d.h. gibt kein Kaufsignal). Wie dem auch sei, Inhalt dieser Abhandlung soll die wichtige Frage sein, wie man Edelmetalle kaufen soll. Ist es "smart", heutzutage Edelmetalle über einen ETF zu kaufen? Ist ein ETF, auf dem eine WKN steht und welches in Ihrem Bankdepot verbucht ist, ein Papier oder ein Metall, sei es physisch hinterlegt oder nicht? Ich möchte hier auch gar nicht in die Diskussion einsteigen, ob alle ETFs dieser Welt wirklich zu 100% physisch gedeckt sein können. Es gab jedoch in der Vergangenheit Untersuchungen, die gezeigt haben, dass gar nicht so viel physisches Gold am Markt vorhanden war, wie die ETFs kumuliert vorgaben, gekauft zu haben. Auch möchte ich nicht näher auf die Diskussion über die steuerlichen Aspekte eines ETFs näher eingehen. Es ist bekannt, dass es neuere Urteile gibt, die z.B. Xetra-Gold nach einem Jahr Haltedauer als steuerfrei erklären, d.h. dem physischen privaten Besitz von Edelmetallen gleichstellen. Auch sei es nicht näherer Gegenstand dieser Betrachtung, wie Schweizer Banken mit Deutschen Kunden in der jüngsten Vergangenheit umgehen. Zwei Beispiele, die mir Kunden erzählt haben: Einer Schweizer GmbH mit deutschen Mit-Geschäftsführern wurde das Geschäftskonto bei der Zürcher Kantonalbank mit einer Frist von drei Monaten ohne Angabe von Gründen gekündigt. Einem anderen Kunden wurde bei der Credit Suisse ein Privatkonto und ein Schließfach ebenfalls ohne Angabe von Gründen mit einer Frist von einem Monat gekündigt. Es sei angemerkt, dass es mitnichten verboten ist, ein Konto in der Schweiz zu führen und man nicht per se ein Steuerhinterzieher ist, wenn man dies tut. Thema Minen: Ich vertrete schon seit Jahren die Meinung, und habe dies in meiner Dissertation auch nachgewiesen und publiziert, dass Minenfonds keinen Hebel auf einen Preis darstellen können, höchstens einen negativen Hebel. Selbst der langfristig beste Minenfonds (laut Onvista der "Falcon Gold Equity Fund" mit der WKN 972376), schaffte es seit Beginn der Edelmetall-Hausse nicht, einen Hebel zu generieren, siehe Abb. 2. Der Brentölpeis fiel gestern zunächst auf ein 4-Wochentief von weniger als 108 USD je Barrel, ehe am Nachmittag eine Erholung einsetzte, welche den Preis bis auf 109 USD steigen ließ. Offensichtlich besteht bei einigen Marktteilnehmern die Hoffnung, dass die gestern bekanntgegebenen Stimulierungsmaßnahmen der EZB (siehe Edelmetalle unten) die Ölnachfrage beflügeln. Wir können uns bestenfalls eine steigende Nachfrage der Investoren vorstellen, welche auf der Jagd nach Rendite die zusätzliche Liquidität auch zu Käufen von Öl-Terminkontrakten nutzen könnten. Allerdings bestehen bei Brent und WTI bereits sehr hohe spekulative Netto-Long-Positionen, was das Aufwärtspotenzial begrenzen sollte. Nennenswerte Auswirkungen auf die physische Ölnachfrage sind durch die gestrigen EZB-Maßnahmen dagegen nicht zu erwarten. Die Ölnachfrage zeigt sich derzeit eher verhalten, was gegen höhere Preise spricht. Zahlen des Beratungsunternehmens Oil Movements zufolge werden die Öllieferungen der OPEC in den vier Wochen zum 21. Juni aufgrund einer saisonal schwächeren Nachfrage in Asien um 110 Tsd. auf 23,34 Mio. Barrel pro Tag fallen. Sie liegen damit weiterhin nur knapp über einem 3-Jahrestief. Für eine schwache Nachfrage in Europa spricht der deutliche Anstieg der ARA-Gasölvorräte, welche in der Woche bis gestern laut PJK International um 14% auf 2,1 Mio. Tonnen stiegen. Dies entspricht dem höchsten Niveau seit Oktober 2013. 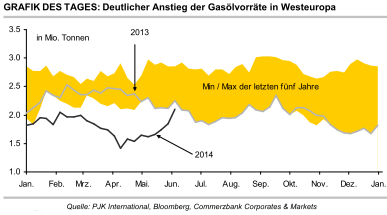 Die bis vor kurzem noch angespannte Marktlage bei Gasöl in Westeuropa hat sich somit merklich entspannt, was gegen eine deutliche Erholung des Gasöl/Brent-Spreads spricht. Die EZB hat gestern ihre Geldpolitik massiv gelockert. Sie hat nicht nur einen negativen Einlagensatz von -0,1% und eine Senkung des Hauptrefinanzierungssatz auf 0,15% beschlossen, sondern auch spezielle Refinanzierungsgeschäfte für Banken, damit diese vor allem in den Krisenländern mehr Kredite an Unternehmen vergeben. Insgesamt stellt die EZB dafür am Anfang rund 400 Mrd. Euro zur Verfügung. Das Maßnahmenpaket spricht aber erst einmal dagegen, dass die EZB bald breit angelegte Anleihekäufe beschließt. Diese sind laut EZB-Präsident Draghi jedoch weiter möglich, wenn die Inflation zu lange zu niedrig bleibt. Während es im Zuge dessen beim EUR-USD-Wechselkurs zu deutlichen Ausschlägen kam, beendete Gold den Handel gestern mit einem Plus von 0,8% und erreichte zwischenzeitlich ein Wochenhoch von knapp 1.260 USD je Feinunze. Im Fahrwasser von Gold legte Silber überproportional zu und stieg wieder über die Marke von 19 USD je Feinunze. Grundsätzlich spricht die weitere Lockerung der EZB-Geldpolitik für höhere Gold- und Silbernotierungen. Platin und Palladium verteuerten sich moderat, was wir aber eher Meldungen aus Südafrika zuschreiben. Nach Entspannungsanzeichen im Minenstreik zu Wochenbeginn beharrt die radikale Gewerkschaft AMCU jetzt offensichtlich doch auf ihren hohen Forderungen und scheint nicht zu Zugeständnissen bereit. Diese Woche haben die Verhandlungen zwischen dem weltweit größten Minenunternehmen, BHP Billiton, und chinesischen Kupferschmelzen über die Schmelz- und Verarbeitungsgebühren (sog. TC/RCs) für das zweite Halbjahr begonnen. Unternehmensangaben zufolge bietet BHP Billiton im Vergleich zum ersten Halbjahr rund 10% niedrigere Gebühren an, während die Schmelzen leicht höhere Gebühren verlangen. Offensichtlich gehen die Meinungen über die Angebotsentwicklung im zweiten Halbjahr weit auseinander. Für gewöhnlich steigen die TC/RCs mit einer höheren Verfügbarkeit an Kupferkonzentrat und fallen entsprechend, wenn das Angebot sinkt. Nach Angaben von gut informierten Kreisen wird China im nächsten Jahr die Exportzölle und -quoten bei Seltenen Erden aufheben. Das Land würde damit ein Urteil der Welthandelsorganisation WTO von März umsetzen, welche die Regelungen als diskriminierend erachtete. Somit könnte mehr Angebot an Seltenen Erden aus China – das Land stand 2013 gemäß Daten der US-Geologiebehörde für 91% der globalen Produktion – an den Weltmarkt gelangen, was wohl auf die Preise drücken dürfte. Chinesischen Zeitungen zufolge könnte China statt der Zölle und Quoten allerdings auch die Steuern auf den Abbau von Seltenen Erden deutlich erhöhen, so dass der Effekt auf das Angebot und die Preise begrenzt bliebe. Die Preise für Weizen und Mais setzen ihre Talfahrt fort. CBOT-Weizen fällt heute den 12. der letzten 13 Handelstage und handelt nur noch knapp über 6 USD je Scheffel auf einem 3-Monatstief. CBOT-Mais liegt den 7. Handelstag in Folge im Minus und steht damit vor der längsten Verluststrecke seit November 2013. Mit weniger als 4,5 USD je Scheffel ist Mais momentan so preiswert wie zuletzt Mitte Februar. Selbst preisunterstützende Nachrichten scheinen den Preisverfall nicht stoppen zu können. So hat das Analysehaus Informa Economics seine Schätzung für die US-Winterweizenernte um 100 Mio. auf 1,396 Mrd. Scheffel reduziert. Heftige Regenfälle im Mittleren Westen der USA könnten zudem Meteorologen zufolge vereinzelt Neuanpflanzungen bei Mais erforderlich machen. Die Marktteilnehmer schauen derzeit aber eher auf die positiven Auswirkungen der Niederschläge für die allgemeine Pflanzenentwicklung. Ein Ende der Talfahrt bei den US-Getreidepreisen ist daher zunächst nicht zu erwarten. Ein Preisrückgang unter 6 USD je Scheffel bei Weizen ist daher nur noch eine Frage der Zeit. Der Preis für Weizen an der Liffe in Paris scheint sich dagegen nach dem ebenfalls kräftigen Rückgang der vergangenen Wochen bei 190 EUR je Tonne zu stabilisieren. Dazu tragen auch Nachrichten aus Ägypten bei (siehe auch TagesInfo von gestern), welche auf eine stärkere Nachfrage des weltgrößten Weizenimporteurs nach EU-Weizen hoffen lassen. Nach dem dynamischen Abverkauf unter die Unterstützungen bei $1.279,10 und $1.265,00 brach der Goldpreis bis an die anvisierte Haltemarke bei $1.240,00 ein. In den vergangenen Tagen verhinderten dort die Käufer einen weiteren Abverkauf und konnten im gestrigen Handel eine erste spürbare Gegenbewegung einleiten. Mit dem gestrigen Anstieg über $1.250,00 hat eine Erholung begonnen, deren Potenzial jedoch in engen Bahnen verläuft: Sollte der Goldpreis nicht wieder direkt unter $1.250,00 abfallen, würde jetzt die $1.265,00-Marke angelaufen. Wird diese überschritten, kann die Erholung bis $1.279,10 führen. Spätestens dort sollten die Bären wieder das Ruder übernehmen und für Abgaben bis $1.240,00 sorgen. Darunter stünde die nächste Verkaufswelle bis $1.214,55 an. Weiterhin würde allerdings erst ein Ausbruch über $1.279,10 für ein vorläufiges Ende des Abwärtstrends sprechen. In diesem Fall könnte das Edelmetall bis an den Widerstand bei $1.307,10 ansteigen.